Is your company storing massive amounts of data? And are you challenged to give your business users fast and easy access to this data? Birst and EXASOL show you how you can deliver extreme levels of performance and scale against complex data sets and large global user populations, while also maintaining data consistency and trust. • Learn how EXASOL delivers half-second response times across multiple billions of rows. • Understand how companies can expect 5-10X improvement in price-performance. • See a product demo of Birst and EXASOL in action. Useful insights are wasted every day because your employees and customers analyze data in silos. What if you could unlock the collective intelligence of your people and your data? Birst 6, the newest release from the global leader in cloud BI & analytics, connects your team’s insights through a network of analytics in the cloud, for trusted insights and smarter business decisions. - Learn how Birst Connected Data Prep empowers business people to smartly access, prepare, and network data on their own. - Understand how Birst’s network of analytics eliminates disconnected silos of information. - Watch a demonstration of the new features in Birst 6. Listen to our interview at Big Data LDN with Richard Neale, EMEA Director at Birst. Companies have embraced the concept of the data lake or data hub to serve their data storage and data-driven application needs. However, gaps remain in the maturity and capability of the Hadoop stack, leaving organisations struggling with how to reap the benefits of these data lakes and how to create analytic applications that deliver value to end users. Richard will examine these two scenarios, where and when each one is appropriate, and how to mature from one to the other..
Spireon, an IoT company, needed a BI platform that could turn over 3 billion records of data, with a projected growth rate of 3x per year, into operational insights both for their internal teams as well as their customers. Organisations are struggling to reconcile two incompatible tiers of BI: decentralised end users adopting discovery tools and centralised BI/IT teams managing legacy analytics environments. Instead of combining these two worlds, organisations are fighting an internal battle over discovery vs. BI – freedom vs. governance – missing a massive opportunity. Learn how forward-thinking companies are outperforming their competition by harnessing the power of 2-tier BI and Analytics in a world where central BI teams work in collaboration with decentralised business units. Mobile BI is proven to drive much greater user engagement, but until now it often required too much time and resources to develop. Building your Next Generation Data Architecture, a webinar co-hosted by Birst and Altiscale. Featuring Brad Peters, Birst Founder and Chief Product Officer, and Raymie Stata, Founder and CEO Altiscale, you’ll hear examples of how customers have operationalised Hadoop in the enterprise, overcoming major obstacles to make data in Hadoop available to broad sets of users across their companies. Do you want to create an analytics product that impresses your customers and drives adoption? In this webinar, James Akers, Lead Product Manager at Thomsons Online Benefit (the global provider of benefits management software), discusses their experience with launching a new analytics solution. Integrating, building and deploying analytics within your solution has never been easier. Birst delivers a comprehensive business intelligence platform that pre-integrates data management, visual language and analytics in one place, and provides the utilities to help you easily embed. Join Forrester Research’s Martha Bennett as she shares her latest findings on what CIOs need to know when evaluating cloud BI solutions. Additionally, Birst will introduce its new Networked BI capabilities and discuss how organisations can leverage it to deliver end-user freedom and enterprise-grade scalability at unprecedented speed. Networked BI virtualizes the entire BI ecosystem, transforming every aspect of an organization’s approach to analytics. Built on top of Birst’s modern, multi-tenant cloud architecture, Networked BI creates a set of interwoven BI instances that share a common analytical fabric. This enables organizations to expand the use of BI across multiple regions, departments and customers in a more agile way, and empowers these decentralized teams to augment their enterprise data with their own local data. Networked BI is different, allowing both top-down and bottom-up blending of data. The result is local execution with global governance, eliminating data silos once and for all and dramatically accelerating the delivery of BI across the enterprise. When faced with the prospect of modernising your BI ecosystem, you probably face a patchwork of data sources and legacy analytics solutions. Impatient business users have often independently acquired desktop data discovery products that promise agility and self-service, but lack the underlying architectures to ensure data consistency and governance across the enterprise. As a result, you face the risk of analytic silos, loss of data security, and eventually, analytical anarchy. The greatest risk of all is to hold steady with your legacy environment. Business groups won’t stand still. When they move forward, they may leave IT behind. Instead of resisting change, IT must deliver a modern approach to BI and analytics that satisfies the business demands for self-sufficiency, while providing an architecture that ensures data governance. Organisations are struggling to reconcile two incompatible tiers of BI: decentralised end users adopting discovery tools and centralised BI/IT teams managing legacy analytics environments. Instead of combining these two worlds, organisations are fighting an internal battle over discovery vs. BI – freedom vs. governance – missing a massive opportunity. Learn how forward-thinking companies are outperforming their competition by harnessing the power of 2-tier BI and Analytics in a world where central BI teams work in collaboration with decentralised business units. On April 15th, Birst announced a technology partnership with Tableau Software. 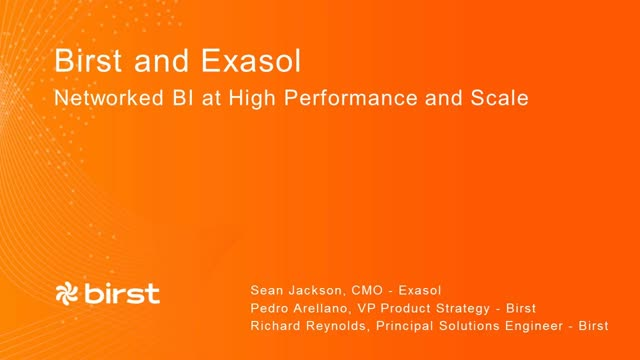 This product integration brings Tableau’s powerful visual analytics to Birst’s agile and scalable Cloud BI data platform through an ODBC connector. Watch this 90 second demo to see how Birst and Tableau work together to ensure numbers never looked so good. Learn how Birst and SAP HANA deliver instant analytics by automatically unifying data from ERP and CRM systems, organizing it into a user-ready data store, and presenting it via reports, dashboards and visual discovery. Visual data discovery is a style of analytics that has transformed the way business users and analysts interact with data. However, it can also result in silos of inconsistent information which lead to analysis anarchy. BI solutions designed for the enterprise must deliver data visualisation and discovery that gives business users the agility and self-service they are looking for while maintaining data consistency and governance across the organisation. Join this webinar to learn how cloud BI and analytics is changing the way organisations approach data discovery by ensuring seamless integration with mainstream BI and minimising the pitfalls that occur when hundreds of users start to work independently within their own data silos.